W. H. OSTERHOUT, prest., Ridgway, Pa.
CHAS. 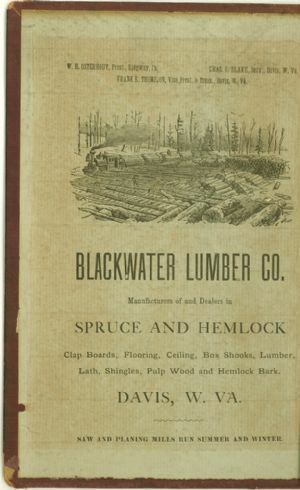 G. BLAKE, Secy., Davis, W. Va.
FRANK E. THOMPSON, Vice Prest, & Treas., Davis, W. Va.
Clap Boards, Flooring, Ceiling, Box Shooks, Lumber, Lath, Shingles, Pulp Wood and Hemlock Bark. SAW AND PLANING MILLS RUN SUMMER AND WINTER. Street addresses--Maryland--Allegany County--Directories; Street addresses --Maryland--Cumberland--Directories; Allegany County (Md.) --Directories.